While I was browsing the app store a few days ago, a game caught my eye, its title glaring challengingly at me. The Impossible Game ($0.99) isn’t quite as difficult as its name suggests, but is still very, very hard. The minimalistic 2D platformer puts you in control of an orange square that scrolls automatically across a thin white line. Triangles and squares block your path, requiring that you jump over them if you want to stay alive. 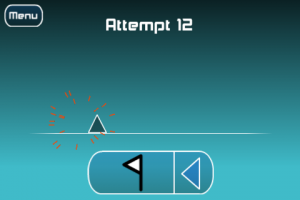 If you touch a shape, or if the line turns black and you don’t evade it, you go back to the start of the level or, if you’ve placed one, the most recent checkpoint flag. You can place these flags at any point in your journey by clicking on the flag button at the bottom of the screen. Although the app comes with just two levels, you can buy a further two for another 99 cents. The value provided by the game is very good, because unless you’re inhuman, you’re likely to spend a long time struggling through each level – to put the difficulty level into perspective, the app rewards you with a medal for attempting a level 500 times without quitting. Oddly, the in-game medals don’t double as Game Center achievements. In fact, the game doesn’t have any Game Center integration – an odd decision given that it would be fun trying to complete a level whilst racking up fewer deaths than friends. Probably the best thing about the app is the balance that it strikes between being difficult and communicating that each part of a stage can be completed if you try it enough times. This balance makes the game ridiculously addicting. The controls are precise enough to make every mistake that you make entirely your fault, and not that of the game. The clean graphics prevent you from excusing an ill-judged jump as a result of the hectic action, instead allowing you to concentrate on the perfect timing that you need to complete each level. Another key part of the game is its soundtrack, which is so good that it’s available to download for free. The music keeps your energy levels high, pumping adrenaline into your ears to add to the excitement of the game. Each level comes with different music, and all of it’s excellent. Overall, The Impossible Game is stupidly, brilliantly hard. If you like apps that need good reflexes, huge amounts of skill and a lot of persistence, it’s worth a look.